For about 8 months now I gathered people over my mailing list by providing the Make Your 2015 The Best Year Ever eBook. It’s the sign up message that pops up when yo go to SavingsPinay blog. If you’ve sent your email address then it means you are part of the mailing list. You can also close the pop up message and continue reading the posts. Now, I know that a lot of the people who signed up for the mailing list weren’t able to receive their copy of the 15-page eBook. I’m so sorry. Though I always see the notification from MailChimp that a new person has subscribed, I find myself procrastinating with just the simple task of sending the copy of the eBook. Don’t worry. Since the learning in the last year’s eBook is applicable almost to any year – it gives basic lessons on personal finance, I know it would still be helpful so expect to get the copy this week. 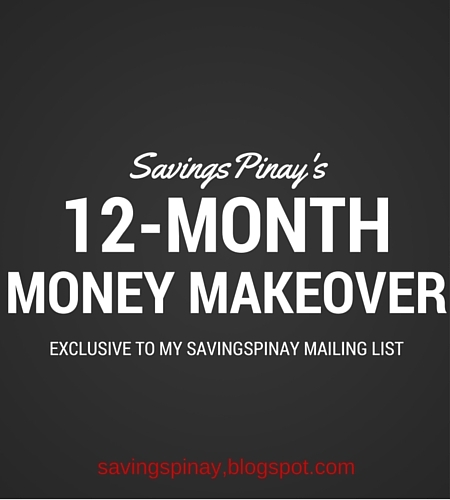 12 Month Money Makeover | Exclusive to my SavingsPinay Mailing List! Starting TODAY until December 31 I encourage you to join my Mailing List. Why? Because I will be having a 12 Month Money Makeover Freebie for all of the solid SavingsPinay Readers!!! Instead of releasing an eBook, I decided to create something that could give a better engagement. 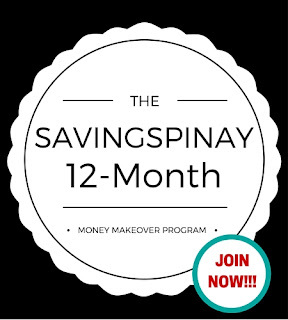 I present to you a SavingsPinay Program that will go on a monthly basis. No fee. No anything. All you have to do is become part of the SavingsPinay Mailing List. Join me and others in the very first SavingsPinay Program entitled 12 Month Money Makeover that will go from January to December 2016. How the SavingsPinay Program work? This is different from the SavingsPinay Series that goes live on my blog. SavingsPinay Program goes straight to your INBOX. Every first day of the Month we will be learning a new financial tip/trick that can makeover our finances. The program is free as long as you become part of the mailing list since I need your email address. 1. An article (can be a video too) introducing the financial topic we will be discussing for the particular month. 2. A Skype Group Chat where you can ask questions about the topic and we can share our thoughts to each other. 3. A forum you can follow on the SavingsPinay Facebook Group where I urge you to join too. 4. Have an accountability group with people who are also in the hope for a money makeover. 5. Other freebies too like infographic, manifesto, template, worksheets and the like. All you have to do is SIGN UP. Become part of the mailing list and enjoy the change that can happen in your financial life. NOTE. This is exclusive to the SavingsPinay Mailing List members. You will receive a THANK YOU LETTER as a sign of confirmation that you are part of the 12 Month Money Makeover Program. It would also include the list of financial tip you will be learning Month after Month. For those who’d like to join, then sign up NOW until December 31. Again, I will only open this exclusively to those who have signed up from today until December 31, then the program will be CLOSED. Thank you for reading this post and I hope you’ll be part of the very first SavingsPinay Program. This is a very nice program to join in especially next year that I must learn to control my spending and increase my savings. I'm definitely signing up for the mail list! 🙂 Thanks for this! Thank you dear!!! Better yet email me at izzaglinofull@gmail.com I'll be sure to include you on the list. Your blog is amazing!! !